As for me, I am over the moon, thrilled and delighted. I felt lucky enough to have a champion in the book with my new agent, Joy Harris, and now doubly lucky to have found a home for it with Little, Brown and Judy Clain. I am one happy, grateful writer. I have not done a blog post for a month now. And what a month it has been! I last blogged from New York City, crouched on a dining room chair in the one room that husband and I lived in while he rehearsed and I rewrote what I hoped would be the final draft of my first novel. One month later, I am back in the UK, and back from the pleasures of the Bridport Open Book Festival and the Bridport Prize. I was told that I was a winner a couple of months ago, but they swear you to secrecy. I am nothing if not obedient, where writing prizes are concerned. The lovely folks at the Bridport prize kept sending back edited copies of my short story, Methlahem, which would be published in their anthology. I am not known for my photographs and, sadly, this is the best of the ones I took. Here is writer and judge AL Kennedy being lovely and generous about each and every winning piece of fiction and flash fiction. She announced that my story had broken her heart which, promptly, broke mine. I gambolled up to shake her hand and managed not to fall back down the stairs. There was an elegant lunch and glasses with bubbles in. I even had a date, my lovely friend Jo, winner of Bridport’s Dorset Prize – twice! But I don’t want you to think it was all seriousness and glamour. 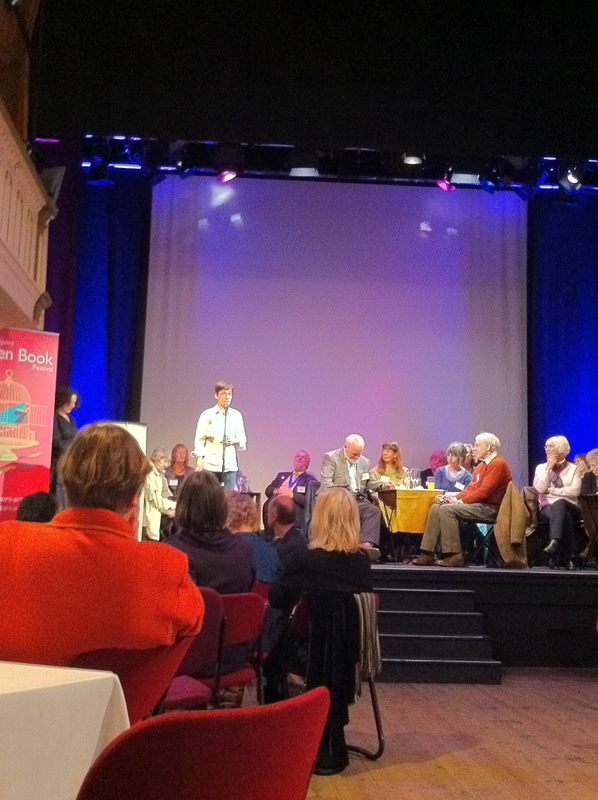 There was also quite a lot of fun: an evening of readings by past Bridport winners Vanessa Gebbie, Judith Allnatt and Adam Marek, a fantastic flash fiction workshop/workout by Vanessa and Tania Hershman, and one of the best live literature performances I’ve ever seen, AL Kennedy and the magic of words. Meanwhile, there were line edits to do. Having finished the New York rewrites, I staggered through jet lag, combing my own words in between the words of others. I have not felt so full in a long time. It wasn’t just the indulgent breakfasts at The Bull Hotel, scoffed while crossing out and changing tenses. It was being full of words, full of writing, full of the company of fine, fine writers. In what other world would we wish to live? The people who run The Bridport Prize, the new festival, and the marvellous arts centre are wholly wonderful, gracious and careful, thorough and hospitable. I’m already thinking I need to write more short fiction, just in the hope that I can go to more of their wonderful events. I also need to point out the generosity of Canterbury Council, who gave me a grant toward the costs of my travel and accommodation. I feel utterly supported and very, very fortunate. Thank you. The anthology has been published. My copy is still by my bedside, lest it vanish like a dream. You can pre-order it in places like Amazon, when it will be available 8 December. In the meantime, Vanessa did a round-up of her Bridport adventure over on her blog – why not pop over? And, while you’re at it, why not start on a story of your own for next year’s Bridport? The deadline is in six months time and the 2012 judge is Patrick Gale. As for the rest of my last month, my new agent is happy with the rewrites and I am trying not to hold my breath until I learn if the line edits are OK. And then there will be a whole new and different kind of waiting ahead. I can’t wait! Well, I can, actually. I can wait for as long as it takes.